Welcome to the Kindred Spirits Project! 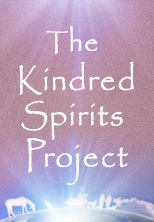 Welcome to The Kindred Spirits Project. 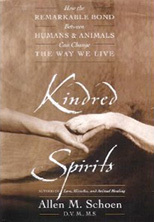 The Kindred Spirits Project encompasses my vision to assist animal lovers throughout the world to gather together and unite in order to nurture, transform, concentrate and focus the unconditional love that they share with their animal companions into compassionate action to help improve the quality of life, happiness and health of all beings. Are you an animal lover who wishes that they could do more to make a difference in the world? Throughout my thirty three years of pioneering Holistic, Integrative Veterinary Medicine, I continuously hear animal lovers who state that they wish they could do more to make a difference in the world. This blogsite has been created as a vehicle to support animal lovers throughout the world to come together with our intentions and compassionate energies to help create a happier, healthier, more loving society and earth! This is a co-creative journey. By contributing, participating, spreading the word, we can change this world, thought by thought, intention by intention, action by action. The result for you is that you will realize that you are an integral part of a solution. By being a part of the kindred spirits project, you will reap great benefits in many ways that will begin to unfold in your heart and mindstream, moment by moment in your daily life. As demonstrated in functional mri’s, by being of benefit to others, you become happier and more peaceful. Join in and help us create a new, more compassionate society filled with loving kindness for all! Again, welcome and thank you for joining us! Through the integration of the latest advances in quantum physics, neuroscience, mind/body medicine, consciousness studies, animal behavior and studies in the human animal bond, I have developed new theories, approaches and techniques that could possibly help transform our society into a more compassionate, happier, healthier society focusing on every place where we connect and interact with animals, our kindred spirits. If I am correct, every animal hospital, animal shelter, horse barn, animal sanctuary as well as each and every animal loving household can be a focal point for expanding compassionate action throughout the world. This endeavor is a co-creative journey, whereby, all animal lovers throughout the world, can review my theories, practice the simple, yet profound techniques that will be available for free on this website, integrate them into their interactions with their kindred spirits and report back with evaluations on their animal companions as well as their own and others responses. There will be questionnaires and surveys that you can fill out/ answer. These will then be collected, collated and shared on the website. I believe that we have the ability as individual animal lovers to gather together and assist in the transformation of society into a more compassionate, happier healthier world, animal by animal, person by person. As the world seems to be bouncing back and forth from crisis to crisis, focusing on fear rather than love, it can be too easy to fall into hopelessness and despair. The Kindred Spirit Project is an opportunity to offer another reality, another approach, re-igniting with unconditional love, passion and compassion each and every kindred spirit, each heart and each soul. Love can be even more contagious than fear. 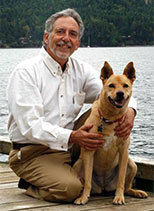 This is a warm, loving invitation to you, all animal lovers to say Yes to a new vision for the 21st century. This is an invitation to help create a more loving, compassionate society. It will require assistance from animal lovers from all walks of life, with many different skills, knowledge and abilities. It will take great skillful means to create this new reality. Based on my discussions with animal lovers throughout the world, I believe it is totally possible and that this new reality, Shambala, a new Garden of Eden, can become a reality beyond our wildest dreams. So many of my clients, friends, readers of my books have asked me how they can take their love of their animal companions and help the world. Their questions have led me to create this project. Please join us in this noble adventure to re-create the Garden of Eden, Shambala!